For years, Makenzee Meaux kept her alopecia a secret, wearing a wig in public and refusing to talk about her hair loss, even with friends — until now. 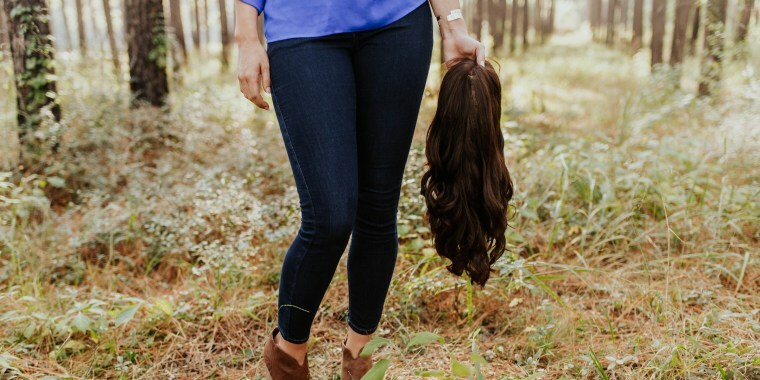 The 21-year-old college student from Crosby, Texas recently shared her striking engagement photos, in which she removes her wig in front of the camera, revealing her bald head. It was "probably the most difficult thing I will ever do in my life," she wrote on Facebook, where the images she shared quickly went viral. Meaux, who got engaged to her high school sweetheart, Bryan Ballard, in May, told TODAY Style that the reveal was no spur-of-the-moment decision. "I had been thinking about it for several weeks," she said. "I've hidden this for so long. And I'm growing up and getting more mature and confident. And, not to mention, I'm getting married! So it's time I learn to accept myself." I've hidden this for so long. It's time I learn to accept myself. Meaux learned she had alopecia when she was 8 years old. She was playing with friends at school when she tilted her head and some of them pointed out that she had a bald spot, and started laughing. When she went home that day, she asked her mom, and sure enough, they found a "softball-sized bald spot underneath the top layer of my hair," Meaux said. While she was otherwise healthy, a doctor confirmed that she had alopecia universalis, a condition characterized by complete hair loss on the scalp and body (as opposed to alopecia areata, which causes only patches of hair loss). "Within six months, all the hair on my body had fallen off," Meaux said. "It was horrible. Friends just shied away from me and became scared, and wouldn't talk to me. It was extremely hard, being so young." Since then, Meaux has worn a custom wig, one made from real hair that sticks to her scalp with adhesive tape. "I'm able to wash it, curl it, straighten it, do everything the same as a normal person," she said. Growing up, she was hesitant to tell anyone about her condition, even Ballard, whom she began dating five and a half years ago. Everyone at school knew I had something wrong with me, but they didn't know what it was. "He knew I had something wrong with me," she said. "Everyone at school knew I had something wrong with me, but they didn't know what it was. It took probably two months of us talking before I actually told (Bryan) what I have." So when they posed for their engagement photos last month, the removal of her wig was a big reveal. For his part, Ballard has been nothing but supportive, Meaux said. "He's been amazing," she said. "He said, 'I'm glad the rest of the world is going to see you the way I see you, and see how beautiful you are.'" Since sharing the photos online, Meaux said she's been contacted by dozens of other people who have alopecia. She hopes they can find some comfort in her story, and that this will raise awareness of the condition. On Saturday, she even has plans to meet a 3-year-old girl who has alopecia and lives in her town. "I never expected it to grow this large," Meaux said. "It's been amazing."